You can enable optional features during the Content step when creating or editing a Message, Automation, A/B Test or a Push Template. Each feature's purpose and settings are detailed here. Available features are dependent on the message types and platforms you selected. If your message audience includes both app and non-app platforms, non-OS-specific app-only features appear under App Options. Web browsers do not support the Buttons, Summary, or Media features. Update the recipient device's app badge. A badge is the numeric display on an app icon that typically indicates the number of unread messages. iOS only. By default messages automatically increment the badge number, but you can specify an exact number, e.g., +3, +12, -3. Toggle to enable, then select either Increment by 1 or Specify. Specify requires a value in the text field. Add one or two buttons to bring even more interactivity to your messaging. Buttons prompt a user to take specific action from your notification. You can also trigger an Airship Message Action A behavior that occurs when a user interacts with your message. when your audience clicks or taps a button. See: Interactive Notifications. Toggle to enable, click Select buttons, and select the buttons you want to add. The Custom Keys option only appears in the Content step when creating a push template. Otherwise this option appears in the Delivery Step. Add an icon for web push notifications, overriding the default icon specified in your Web Notify configuration. Web only. Safari is not supported. Toggle to enable, then enter the URL for your icon. The URL must be HTTPS and should be accessible by your audience; the icon must be a static image. If your account has CDN enabled, you can Upload media rather than entering a URL. 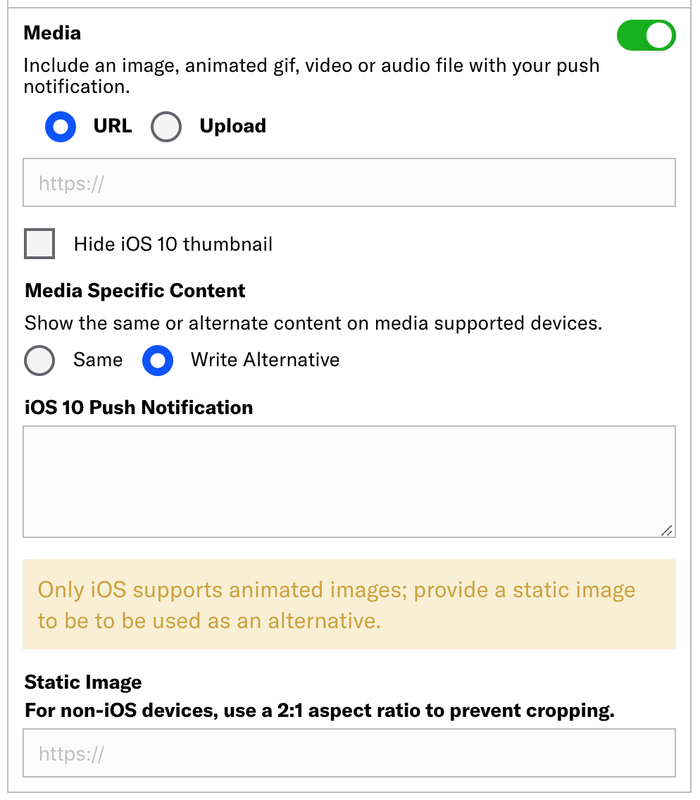 Select the radio button for Upload, click Upload Media, and select a media file. The maximum file size is 2 MB. Contact Airship Support if you are interested in enabling CDN media hosting. Add media to your notification. Toggle to enable. Enter the URL for the media to be displayed with the push notification. Image, animated gif, audio, and video are supported. See the API reference for allowed file types and requirements. Ensure the URL will be accessible by your mobile audience. HTTPS is required. Hide iOS thumbnail: By default, a thumbnail of the media is displayed in the message alert. 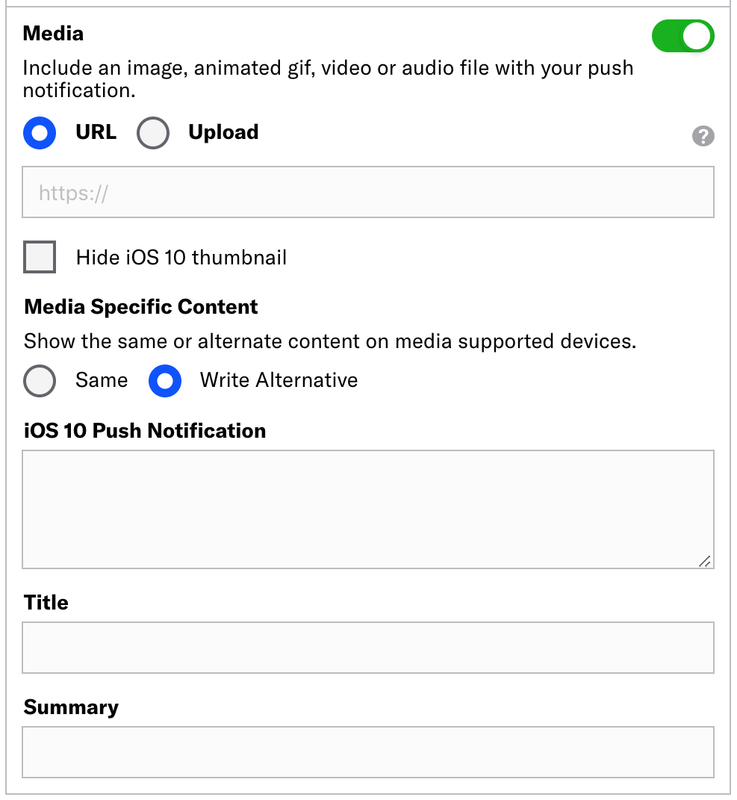 Media Specific Content: By default, iOS 10+ devices will receive the Same push notification as pre-iOS 10 devices. If you would like to send a different message to iOS 10+ devices, select Write Alternative, and enter alternative message text in the iOS 10 Push Notification box. Alternate Title and Summary fields will appear here only if the initial Title and Summary fields preceding Media have been enabled and filled out. Enter the URL for the media to be displayed with the push notification. Only static images are supported. See the API reference for "style". Ensure the URL will be accessible by your mobile audience. HTTPS is required. When you enable both the iOS platform one or more of Android and Amazon, the URL field is labeled Picture for Android. The Picture for Android field is removed if a URL for a static image is entered in the initial URL field. Send your message with a specific notification category instead of the default. A notification category is a grouping mechanism for messages in Android versions 8.0 and later, synonymous with Android notification channels. Users can set behaviors for each notification category within your Android app, determining the types of messages they are most interested in. Toggle to enable, then select a category from the dropdown menu. You must add your app's notification categories to your Airship project before you can select them for your messages. Navigate to Settings » Configuration » Android Notification Categories. Play a custom sound when your audience receives a message. The file must be bundled with your app by your app developer. iOS only. Toggle to enable, then enter the name of the sound file, e.g., "default" or "beep.caf". Add a summary line, supplemental text displayed with the primary notification message. Toggle to enable, then type your summary in the text field. iOS 10 and later: The summary appears below the push notification title. See: iOS 10 documentation. Android and Amazon: The summary appears below the main notification text in most cases. This is the only visible text other than the title when Android Picture is visible in expanded mode, as the main notification text is suppressed. See: Android documentation. For web browsers, the title set here will override the default title. Toggle to enable, then type the title in the text field.